As you know, I've been obsessed with my Silhouette Cameo lately. Mostly I have been adding cut files for some of my stamps. But for the next few days I'll be showcasing some non-stamped cards. This beautiful spray of flowers is a print and cut file from the Silhouette Store. I printed one of them and then cut four of them to stack up to make a chipboard-like embellishment. The little chevron embellishment is also a cut file, but I modified it just a bit. I decided to make a shaker card using this little cluster. 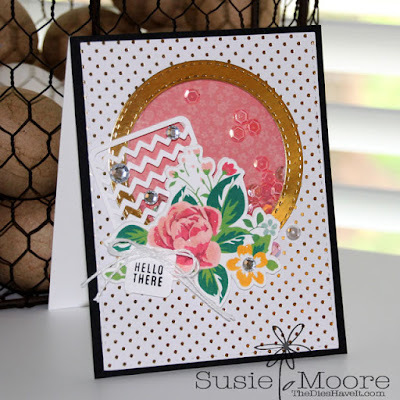 Gold patterned paper and a die cut gold frame just seemed the perfect additions for today's card. If you needed a little cheering up today, I hope this card helped a little!! Stay tuned and I'll see you right back here tomorrow.